So you have heard people gushing about GarageBand or you have used it yourself and love it… But what if you have a Windows PC? GarageBand does not work on PC’s period (and that is the final answer). There are articles and videos all over the net telling you that you can (believe me I tried), these are simply not true, mostly hoaxes and in the worst cases trying to get you to damage your computer. So beware, you have been told! do not waste any more time on it. GarageBand is a MAC only deal and will always be. But all is not lost, there are alternatives to GarageBand for Windows and some are REALLY close in design and function (so close I wonder why they haven’t been sucked into patent disputes!) and I am going to walk you through them. 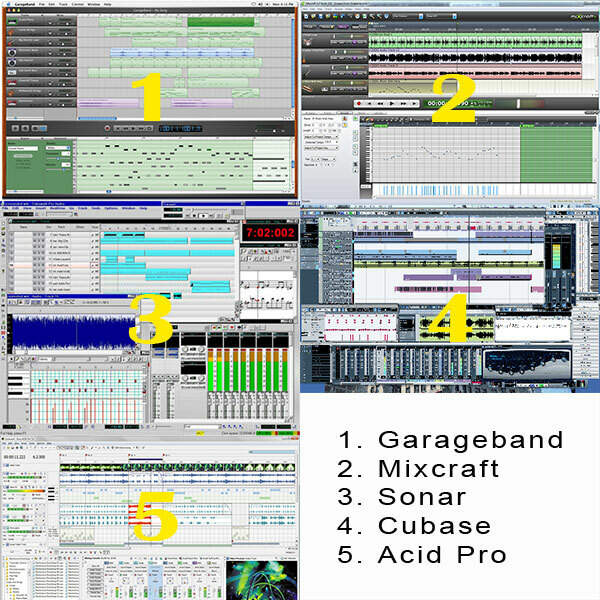 Over the next few weeks I am going to talk about Mixcraft, Cubase Studio, Cakewalk SONAR and Acid Pro, so check back for detailed reviews of how they compare to GarageBand. First up here's an idea of how they each look in comparison to Garageband. Clearly, Mixcraft is the stand out closest to GarageBand in this department, but looks are not the only thing we will be taking into consideration. Stick around for the detailed reviews and final assessment.